Researchers in the University of Maryland Department of Physics contributed to the international effort that led to the discovery of these gravitational waves, building on the university’s long history in this field. In the early 1960s, the late UMD Physics Professor Joseph Weber built the world’s first gravitational wave detectors on the university’s College Park, Md. campus, inspiring a new field of research. Shawhan helped to validate the analysis software that identified the black-hole merger signal a few minutes after the LIGO detectors recorded it. He also acted as a liaison with astronomers before and during the LIGO observing run. UMD physics graduate student Min-A Cho developed software to communicate the properties of promising signals to astronomers for follow-up observations with their telescopes and other instruments. Cregg Yancey, also a UMD physics graduate student, helped to check that the detectors operated properly when the signal was detected. The black-hole merger signal stood up to all scrutiny during months of painstaking analysis and cross checks and was ultimately named GW150914, indicating the date of its arrival at Earth. Alessandra Buonanno, a UMD College Park Professor of Physics who also has an appointment as Director at the Max Planck Institute for Gravitational Physics in Potsdam, Germany, together with many students and postdoctoral researchers at both institutions, have developed highly accurate models of gravitational waves that black holes would generate in the final process of orbiting and colliding with each other. UMD alumnus Andrea Taracchini (Ph.D. '14, physics), who is now a postdoctoral researcher in Buonanno's division at the Max Planck Institute in Germany; Buonanno; Yi Pan, a former assistant research scientist in physics at UMD; and Enrico Barausse, a former postdoctoral researcher in physics at UMD, developed waveform models that were employed in the search that observed the black-hole merger with high-enough significance to be confident in its detection. UMD physicists are continuing a long tradition of gravitational wave research that began over 50 years ago. Weber’s early detectors used “resonant bars”, which were designed to ring when a gravitational wave passed through them. UMD Physics Professors Emeriti Ho Jung Paik and Jean-Paul Richard improved on Weber’s technique to develop more sensitive resonant detectors. 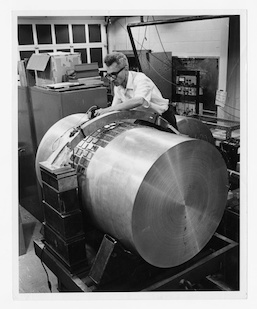 Later technology improvements enabled the more-sensitive laser interferometer technique used by LIGO. “As we continue to improve our detectors and collect and analyze more data, we expect many more discoveries that will give us a fuller picture of the gravitational dynamics that have shaped our universe, with all its galaxies and stars, along with weird, wonderful things like neutron stars and black holes,” said Shawhan. LIGO research is carried out by the LSC, a group of more than 1000 scientists from universities around the United States and in 14 other countries. More than 90 universities and research institutes in the LSC develop detector technology and analyze data; approximately 250 students are strong contributing members of the collaboration. The LSC detector network includes the LIGO interferometers and the GEO600 detector. The GEO team includes scientists at the Max Planck Institute for Gravitational Physics (Albert Einstein Institute, AEI), Leibniz Universität Hannover, along with partners at the University of Glasgow, Cardiff University, the University of Birmingham, other universities in the United Kingdom, and the University of the Balearic Islands in Spain. The discovery was made possible by the enhanced capabilities of Advanced LIGO, a major upgrade that increases the sensitivity of the instruments compared with the first-generation LIGO detectors, enabling a large increase in the volume of the universe probed—and the discovery of gravitational waves during its first observation run. The U.S. National Science Foundation leads in financial support for Advanced LIGO. Funding organizations in Germany (Max Planck Society), the U.K. (Science and Technology Facilities Council, STFC) and Australia (Australian Research Council) also have made significant commitments to the project. Several of the key technologies that made Advanced LIGO so much more sensitive have been developed and tested by the German UK GEO collaboration. Significant computer resources have been contributed by the AEI Hannover Atlas Cluster, the LIGO Laboratory, Syracuse University and the University of Wisconsin-Milwaukee. Several universities designed, built and tested key components for Advanced LIGO: The Australian National University, the University of Adelaide, the University of Florida, Stanford University, Columbia University of New York and Louisiana State University.